With crime at such high levels these days it is important for both business and home owners to make sure their premises are secure with the latest burglar alarm systems. Premier Security Systems provide installation, maintenance and monitoring services for domestic and commercial alarm systems. Their Wireless burglar alarms can be installed with no mess or fuss and can communicate with the property owner via mobile phone as well as be connected to an alarm emergency centre. Premier Security Systems have been a client of ours for several years and the services that Ardnet Online Solutions provide to the company over the years constantly grows. 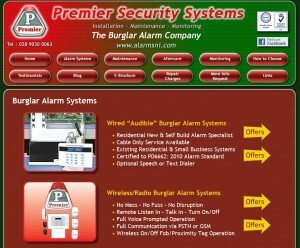 This new site provides information on all the different types of alarm systems that can be installed. Social media links allow customers to interact with the company and online enquiry forms mean that potential customers can get intouch easily. Remote email systems allow the client to stay intouch with his customers on the move.